I am a big fan of collaborative art projects created by children and youth that can be displayed in the sanctuary, education wing or church entry. After two years, we have quite a collection going. Last year we created this beautiful piece called, “Come, Holy Spirit” which still brightens our hallway. 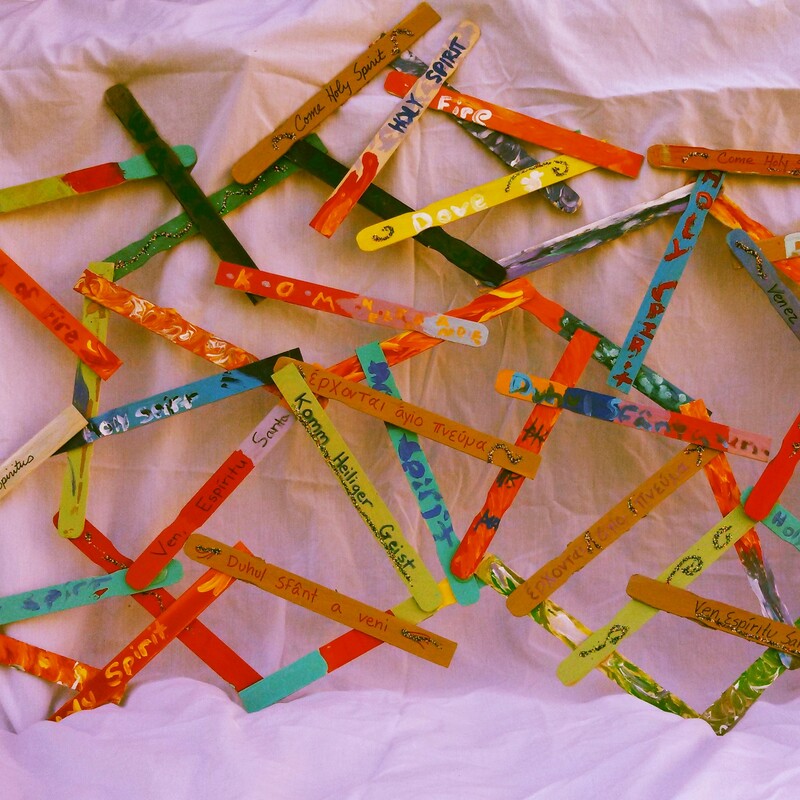 Children and youth decorated paint sticks with symbols of the Holy spirit using acrylic paints and glitter. When they were dry, they wrote “Come, Holy Spirit” in different languages (I provided a sheet with the phrase written out in various languages). I used a hot glue gun to glue them together in a random fashion. This year Pentecost is a bit later and so we had less time to create something as elaborate. I have challenged myself to use up the years worth of s craft supplies that have been collecting at church before buying much of anything new. Luckily we have lots of fabric and paint! I cut a piece of white cloth (don’t know what type but it was thin, shiny and synthetic) into tapered, wavy strips. The kids used red and yellow tempera paints to create a flame effect on each piece. After they dried I stapled them to a hula hoop along with some leftover red and orange fabric strips and curling ribbon. Since the supplies were already on hand, the cost was a whopping $0!! This creation (what to name it??) may end up in the sanctuary or in our Sunday school room. Either way, I think it turned out pretty great. Blessings on your Pentecost Sunday! Next How will we leave our mark this week? The flaming hula hoop is really cool!